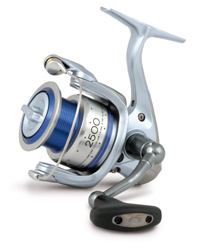 The feathered detail on the handle stem spine sets this family of reels apart at a glance. Featuring a T shaped ergonomic handle it looks exactly like it is; a serious player in the fixed spool market. The front micro adjustable drag gives instant adjustment of clutch control and the A-RC spool lip on the cold forged spool delivers increased casting range for less effort. With six versions to choose from including a new match edition (3000S) - each reel is supplied with a spare cold forged spool included in the price. Three shielded A-RB bearings and a roller bearing produces a 7 ball bearing performance that will provide years of reliable fishing service.